High in omega 3 & 6 fatty acids and vitamin C will all give your skin a beautiful healthy glow. 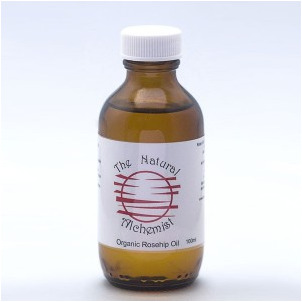 Rosehip oil is used for burns, including UV damaged skin and radiation burns. It is also helpful for chronic ulcerations of the skin, skin grafts, brown spots, prematurely aging of the skin and dry skin. Also great for hair care including coloured, permed or tinted hair, damage from to much sun or cold weather. Rosehip oil is also an excellent oil to use on babies & new born babies, great to bath baby in, keeping their delicate skin soft and sweet smelling. Using this oil will also help prevent the formation of cradle cap. All massage oils are now in attractive new blue bottles with pressure pump for your convenience.